Insurance Insight Inc. exclusive distributors of the WALKAWAY vehicle return program, recently set up their new head office in Oakville Ontario. 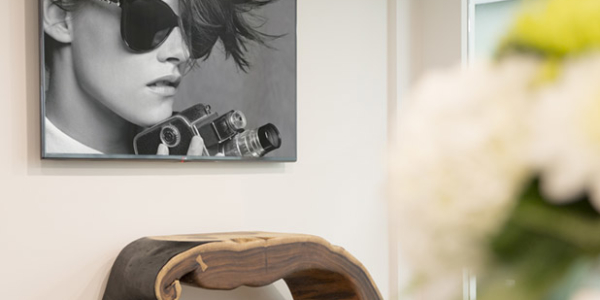 They invited PM WYRE to create a state-of-the-art Boardroom for their new space. 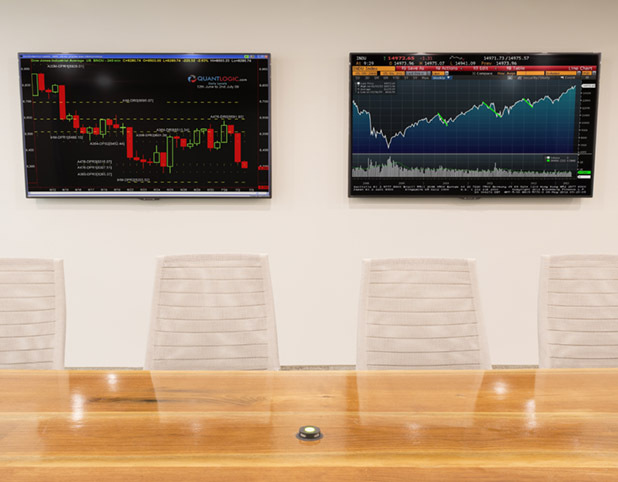 Insurance Insight knew they wanted a reliable, high quality audio conferencing system, a projector, a screen, and lighting, all automated from a touchscreen panel built into their boardroom table. They wanted a clean look with no towers for components, and no wires that were either visible or that could be easily displaced by an errant foot. Above all they wanted a reliable system that everyone could easily operate. Keeping the components out of the Boardroom was the biggest issue, given that all of the components would be housed in a server room which was not adjacent to the Boardroom. 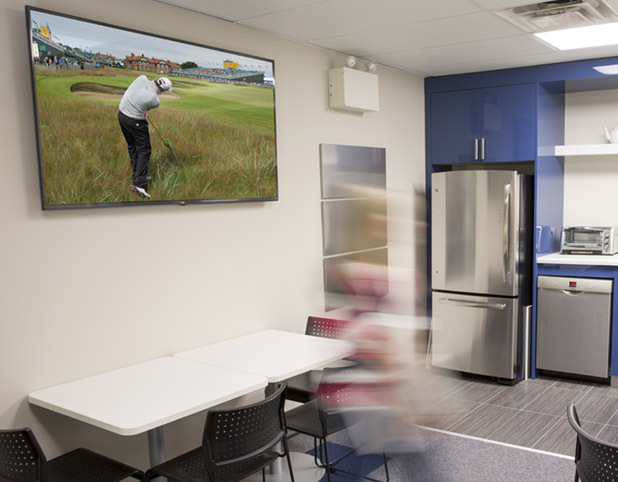 We agreed that the components needed to be housed outside of the boardroom space, and were able to overcome the technical challenges by running the wiring through the floor to the basement and back up through the floor into the boardroom. 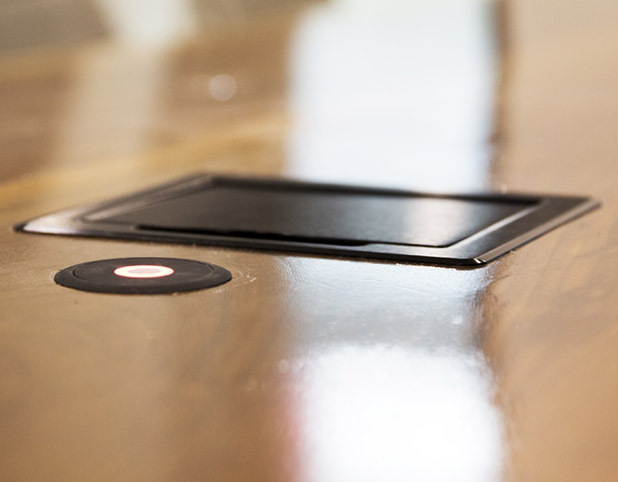 We hid all of the wiring to the boardroom table itself within the legs of their existing boardroom table. We then installed an in-ceiling retractable Da-Lite screen and a standard mounted projector. Complementing the screen we added 2 Sharp 70” TVs and 4 Martin Logan 60i in-ceiling speakers. Flush-mounted pop-up Clock audio mics were installed into the Boardroom table to round out the audio requirements. And to manage the various lighting configurations the room would demand, we installed a Crestron Automated Lighting System. 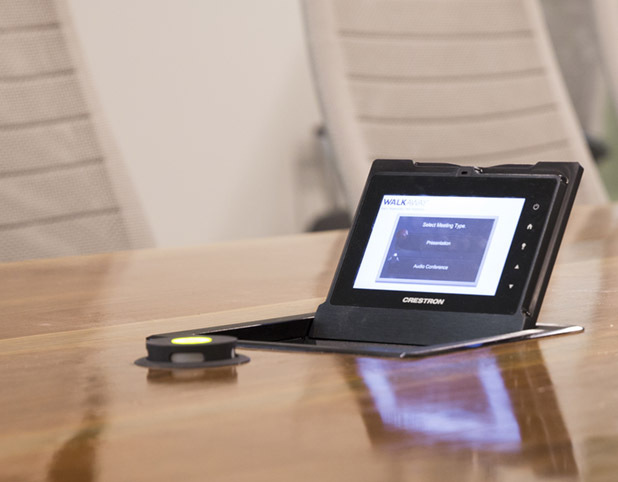 The HDMI refractors, the Ethernet connections and the Power were all installed into the Boardroom Table. Finally, we installed flip-top touchscreen panels into the Boardroom table to control all of the systems from one place. Insurance Insight loves their new office… and is really diggin’ their beautiful boardroom that can transform from the perfect gathering place to celebrate the office birthdays into a multi-media Power Boardroom – all at the touch of a button.